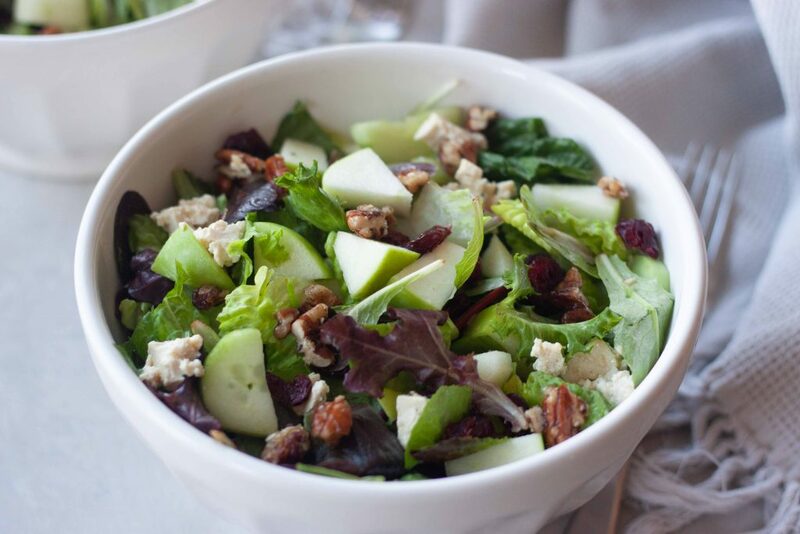 Keeping things simple this week with Thanksgiving only days away and sharing a simple Apple Cranberry Maple Pecan Salad along with a couple others that are favorites this time of year. If you’re looking for a simple salad to throw together this week or after the holiday or to make for Thanksgiving I’ve got you covered! 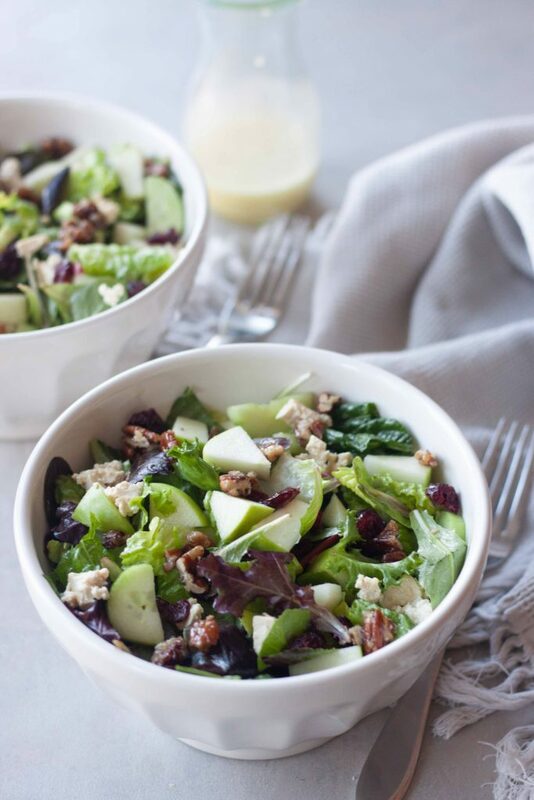 This Apple Cranberry Maple Pecan Salad is a twist on one at a local restaurant. They serve it at their buffet and it was screaming my name recently when we were back there for a girls brunch because with this pregnancy I’ve had a crazy huge craving for blue cheese! Of all things blue cheese?! Of course buffalo flavors too along with that but I’m starting to wonder if it’s for the blue cheese. I haven’t had it in years. If you follow me on social media or know me you’ll know that pancakes and waffles are also at the top of the cravings list and have been longer than the recent blue cheese cravings. Of course my doctor told me many lactose intolerant women can handle dairy while pregnant and since coconut yogurt and ice cream haven’t been agreeing so I’ve debating and tried a couple things but blue cheese is off limits anyways so that wouldn’t help me. Let’s just say I’ve spent far too many hours lately trying to recreate a dairy free and vegan blue cheese that would be acceptable. Plus if I make it with tofu that gives me added protein I’m really needing right now and trying hard to get in. If you have any suggestions for dairy free blue cheese PLEASE let me know! Until then I will keep tweaking and make this salad with Tofu Feta. If you are a blue cheese fan I highly suggest making this with blue cheese if you can have it. 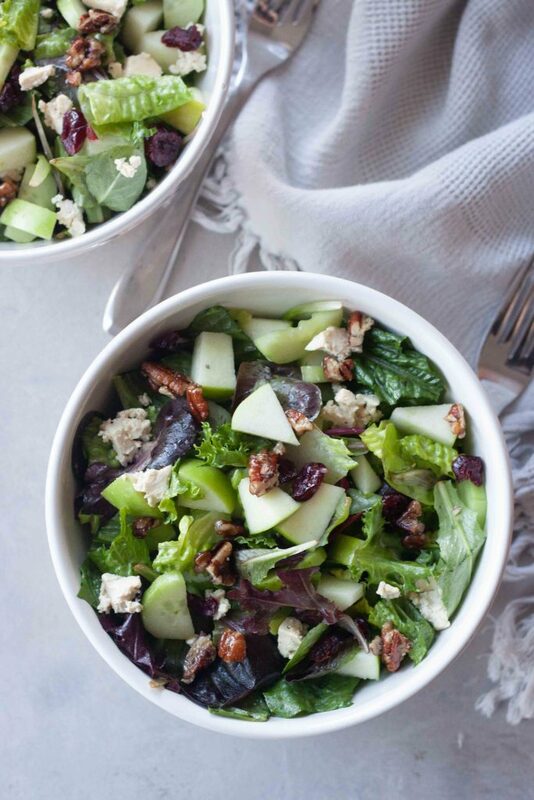 This salad is packed with romaine, spring mix, English cucumber, tart crisp Granny Smith apples and dried cranberries, sweet Candied Maple Pecans, and crumbled blue cheese or feta. Finished with a simple Honey Lime Dressing (there is a honey free vegan option as well). You’ll want to make extra Candied Maple Pecans though because their a favorite loved by everyone, especially this time of year. Luckily they’re easy to make since they disappear so fast. As I mentioned a small Thanksgiving again this year up north. I’ll make my traditional cranberries as well as a non brandied version. I’m also planning on making some sourdough bread (maybe the Cranberry Swirl Sourdough I shared on Instagram) and my Pumpkin Pie Peanut Brittle Cups as well as another batch of Cast Iron Cranberry Crisp this week. I hope you all have a wonderful Thanksgiving with family and friends. 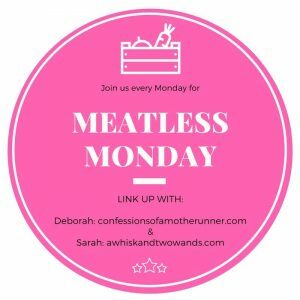 First though today is Meatless Monday and I look forward to seeing what’s happening in your kitchen and hope you link up with me and my co-host Deborah and share! I also hope you check out and are inspired by the recipes linked up below. 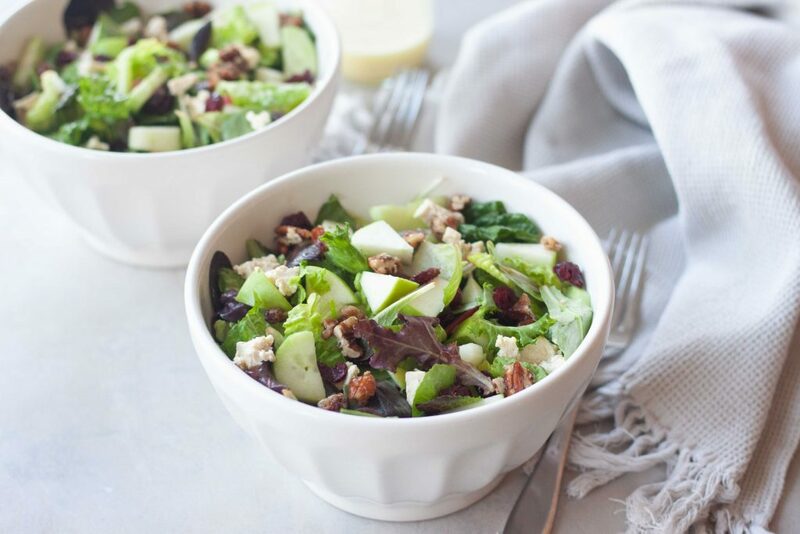 Simple delicious Apple Cranberry Maple Pecan Salad is packed with romaine, spring mix, English cucumber, tart crisp Granny Smith apples and dried cranberries, sweet Candied Maple Pecans, and crumbled blue cheese or feta (dairy free/vegan recipe). Finished with a simple Honey Lime Dressing. Great for a simple dinner or to add to your next holiday spread. If using the Dairy Free Feta you will need to prepare it ahead of time. 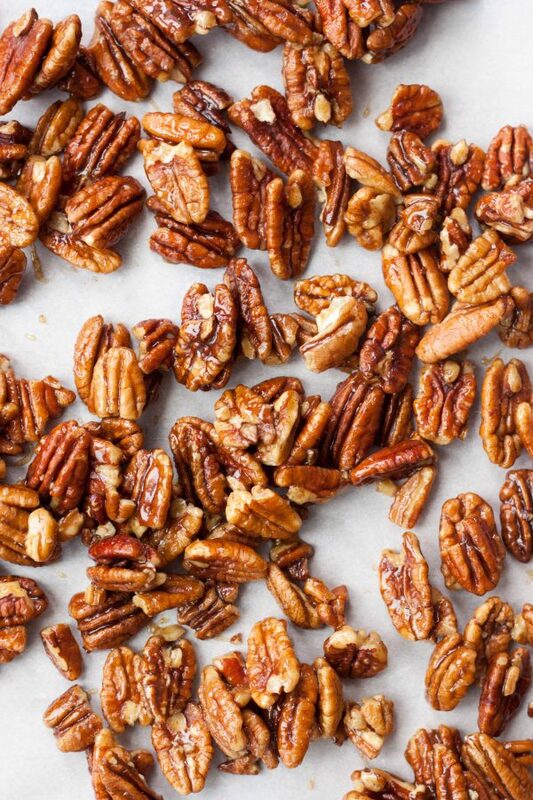 Prepare the Candied Maple Pecans and let cool while preparing the rest of the salad. Make the Honey Lime Dressing my shaking or whisking all the ingredients together. Both the Candied Maple Pecans and dressing can be made ahead of time. Just store the dressing in the refrigerator. Peel the English cucumber, slice, and cut the slices in half. Slice and core the apples and cut into chunks. Assemble one big salad or individually tossing together romaine, spring mix, cucumbers, apples, cranberries, dressing, and cheese. Roughly chop the Candied Maple Pecans and sprinkle on top. Quick and easy homemade tofu feta is a great dairy free/vegan substitute for feta in salads and other appetizers. Press water out of tofu. Place tofu between paper towels and put something heavy on top. Let it sit for at least an hour. You can also do this overnight in the refrigerator. Prepare marinade. Whisk together every ingredient in a bowl until nice and even. Cut tofu into small cubes and add to a jar or an air-tight container. Add marinade and shake to mix together. Place jar in fridge and let tofu marinade for at least 2 hours. Great flavors for this week! and a nice fresh salad is perfect with all the decadence to come! I get stuck making the same salad, but this one looks like a nice of change of pace with lots of yummy flavors going on. I’ll have to try it!!! Hmm, I’ve done tofu feta on pasta salads, but not on green salad. I love this idea and the fall flavors. Might need to swap the romaine for another green right now though! 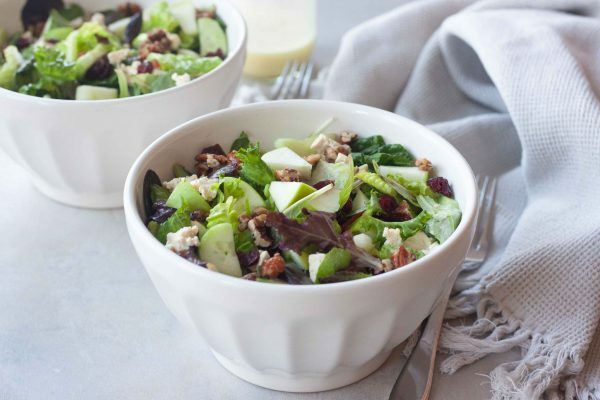 What an awesome fall salad! I’ll def need to make this next week 🙂 Perfect for a healthy lunch. 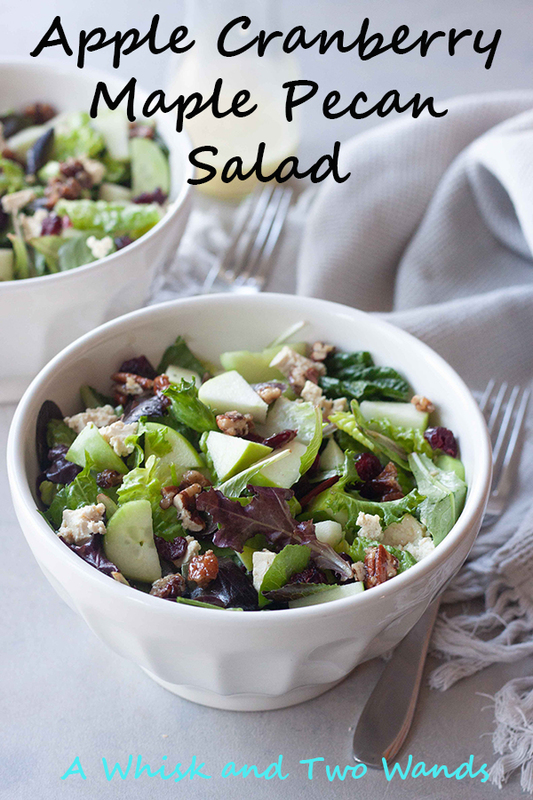 Love everything about this salad! It screams the best of fall flavors!